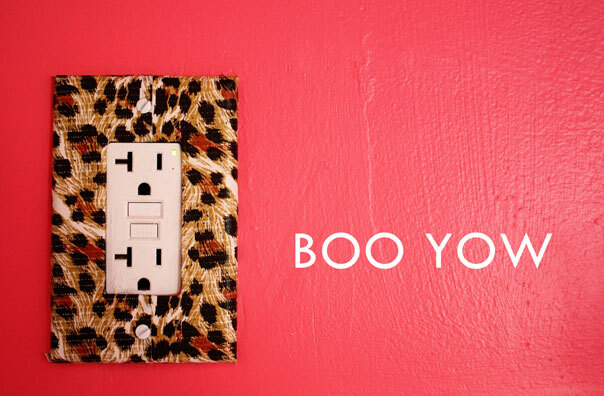 In my never-ending effort to infuse animal print into every nook in my home, I decided to cover my kitchen’s electrical outlets in leopard. Initially I was thinking about decoupage wrapping paper, but considering the number of times I have wiped splatters of cake batter and spaghetti sauce off my kitchen outlets (don’t act like you have never done it) that idea went out the window. 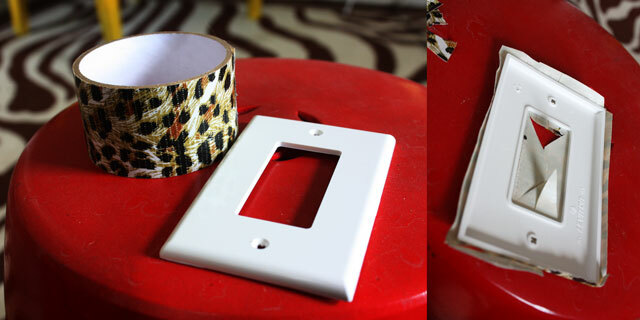 Lucky for me, Duck Tape makes a variety of interesting patterned options, including my beloved leopard. Boo Yow! Argyle tape? I didn’t even know!!! Good idea 😉 Target has some nifty tape too — I saw some Hello Kitty duct tape that was pretty darn awesome! I am so glad you shared this. Now first to Target, then to my shoe closet. I have a couple of pairs of sneakers and flip-flops that are crying out for an upgrade. Thanks. Way cool! So much quicker than the wrapping paper version, too! My local BabyGrands LOVE duct tape. A friend of theirs had a Duct-Tape-Items-For-Sale business, last winter. She sold quite a few items in the ski lodge; it’s where my kids got hooked. For my birthday, they made a huge bag using it and wrapping paper. It had love notes written on it, as well. As irony would have it, when I did the blog below we were working on a gigantic flower, as per Auntie Peaches. I even mentioned your name, noting that when we eventually FINISH the project, my readers shall be directed to your tutorial. See? There is ARGYLE duct tape?! Can’t believe I was not alerted to this sooner. (Argyle to me is leopard to you 🙂 Oh happy day! This is super cute. My teenager is going to love this. Thanks for the “HOW TO”. Oh super cute! Thank you for the “HOW TO” my teenager is going to love this.